Classically designed and with a sparkling chrome finish, the Ecostrad Fina-E will complement bathroom interiors of any style. This thermostatic electric towel rail lets you adjust your heating to suit changes in season so you can economise in summer and enjoy total comfort in winter. For even more convenience, it also comes with a 2-hour timer to limit your energy usage and ensure toasty towels at the same time. Download the SOA heating element manual here. Radiators and towel rails for bathrooms, cloakrooms and wet rooms must be professionally installed by a qualified electrician and are not sold as a DIY product. Always defer to the manufacturer's guidelines about the bathroom suitability of any product. Ecostrad Fina-E towel rails come with a pre-fitted electrical element. This element may be on the left or the right-hand side of your towel rail. If you wish, you can remove the element and switch it to the other side of the towel rail. However, this is a job for a professional electrician and all manufacturer's instructions must be followed. Ecostrad Fina-E Thermostatic Electric Towel Rails come with a 5 Year Warranty on the heater body and a separate 1 Year Warranty on the electrical element. This sleek and stylish chrome version of the Ecostrad Fina-E provides an elegant bathroom heating solution with its straight bar design and sparkling finish. Using its thermostatic SOA element, it's also an adaptable and convenient way of heating your bathroom compared to towel rails with only basic manual control. The Fina-E is filled with heat-retentive thermal fluid that stays warmer for longer, which means that it uses less energy to maintain its heat levels. Using the SOA heating element you can also save energy by adjusting the output of your Fina-E electric towel rail to suit the seasons. Turn down its output to minimum when the weather's warmer and turn it up to maximum to ensure you keep your towels toasty and dry in winter. An integrated timer in the element also allows you to set your towel rail to run at a fixed heat level for a duration of 2 hours, after which it will return to standby. The LED buttons on the front face of the SOA heating element make it easy to adjust your heating and it also includes an anti-frost function that will engage when temperatures drop too low. 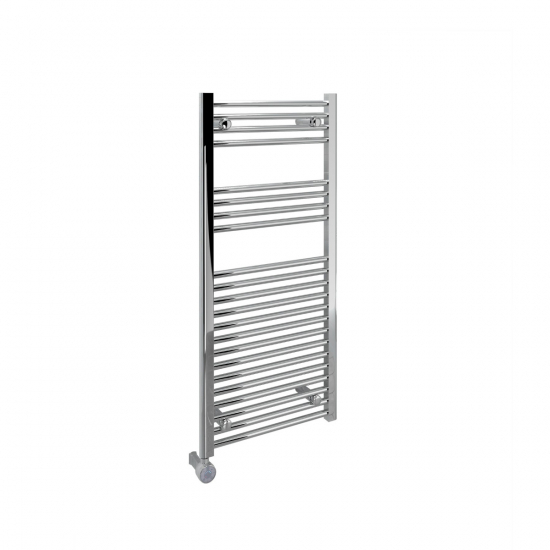 Featuring a robust IP55 splashproof protection rating and a generous 5 Year Manufacturer's Warranty, the Ecostrad Fina-E Thermostatic Electric Towel Rail is luxury bathroom heating at a fraction of the price.